Shirakawa Komine Castle (白河小峰城) is located in Shirakawa, Fukushima. It is one of 100 best castles of Japan and also popular Hanami spots. It is a hilltop castle with stone walls, moats, gate, and Tenshu-kaku. Komine Castle is very unique castle for Tohoku area because it built with full stones. 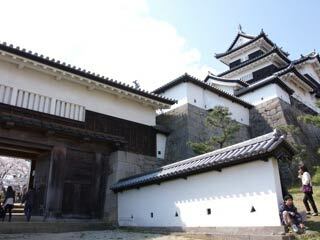 It is also considered as three major castle of Tohoku Region. Komine Castle was built in 1340 by Yuki Chikatomo. He built the castle on the top of small hill, called Komine Hill. In 1627, it was under the control of Niwa Nagashige, who transferred 100,000 Koku from Tanagura Castle. He renamed this castle to Shirakawa Castle and expanded the scale of the castle to the current structure in 1632. During the most of the Edo Period, the castle was ruled by the Matsudaira clan. Komine Castle became the stage of a battle during the Boshin War in 1868, where the allied forces loyal to the Emperor Meiji sieged the castle and defeated the Aizu's force. Most of the buildings were lost during this battle. Current Tenshu-kaku and the gate were reconstructed in 1991. During the late April, Castle is covered by full of cherry blossom, Sakura, and it is one of the popular Hanami spots in the area.